I’m not sure where this obsession started. Maybe because I tend to have a lot of things running around my brain, which leads to regular omission of important items. Maybe it’s because I’m a visual person and I need to actually SEE what I have, and what I don’t have, in order to stay organized. Whatever the reason, I know it’s crazy but I also know I’m not alone. I read once that your to-do list for the day should only contain 3-5 items, as any more than that will either paralyze you by making you feel overwhelmed, or will constantly force the excess items to the bottom of your list, making you feel unproductive. I’m guilty of doing this often, but I still try to compile EVERYTHING that needs to be done, packed, purchased, cleaned, or returned. I found some sage advice via Lifehacker: put only actionable items on your list. 1. Find a new dentist. 2. Replace the broken glass table top. 1. Email Jayne and ask what dentist she goes to. 2. Measure the table dimensions. Call San Diego Glass at 555-6789 with dimensions. 3. Check U of Whatever’s website (whatever.edu) for fall Italian class offerings. 4. Draft a list of five website upgrades. The full article is a good read. Maybe you can add it to your to-do list. 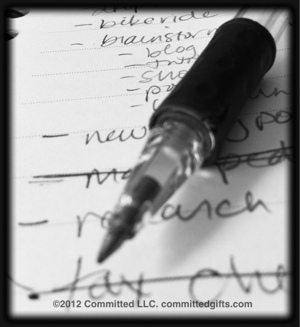 Have you ever added something to your list, just so you could cross it off? Pingback: How Google Docs Cleaned my Dining Room Table « Committed.